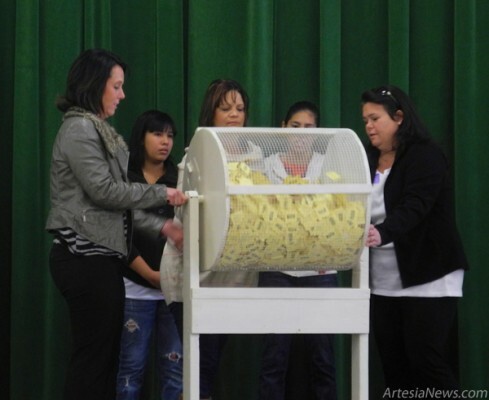 Members of the Grand Heights Early Childhood Center PTO spin the raffle tumbler prior to drawing the winning ticket. Students piled into the gymnasium Tuesday afternoon at Grand Heights Early Childhood Center for a fun-filled assembly. The kindergartners recently held a fundraiser selling tickets that would allow one lucky person to win 300 gallons of gas from Fenn’s Country Market. Megan Miller of the PTO helped organize the event as well as the drawing. Miller’s daughter, Kirklyn, pulled the winning ticket from the raffle tumbler. Jourdan Rodriguez, a new teacher at Park Junior High, was the winner. The staff called his cell phone, and all of the children shouted a message saying, “Congratulations – you won the Grand Heights fundraiser!” … For the rest of the story, subscribe in print and on the web.